SantaCon is “a charitable, non-commercial, non-political, nonsensical Santa Claus convention that happens once a year to spread absurdist joy,” say the organizers. The event for Santa-dressed bar hoppers takes place Saturday, Dec. 8, as early as 10 a.m. in New York City. The starting point is at Plaza 33, at 33rd Street and 7th Avenue in Manhattan. Organizers have released a list of venues on this Web page (keep scrolling). You can find out more on the official website. 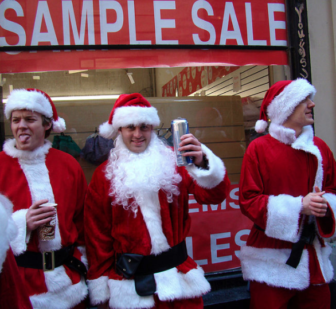 Alcohol will not be permitted on Metro-North trains and stations from noon, Saturday, Dec. 8 through noon, Sunday, Dec. 9, to maintain safe and orderly travel during this weekend’s SantaCon event.